Sketched Sept. 21, 12:50 p.m.
As Boeing prepares to deliver the first 787 on Sunday, the workers must feel a great sense of accomplishment. 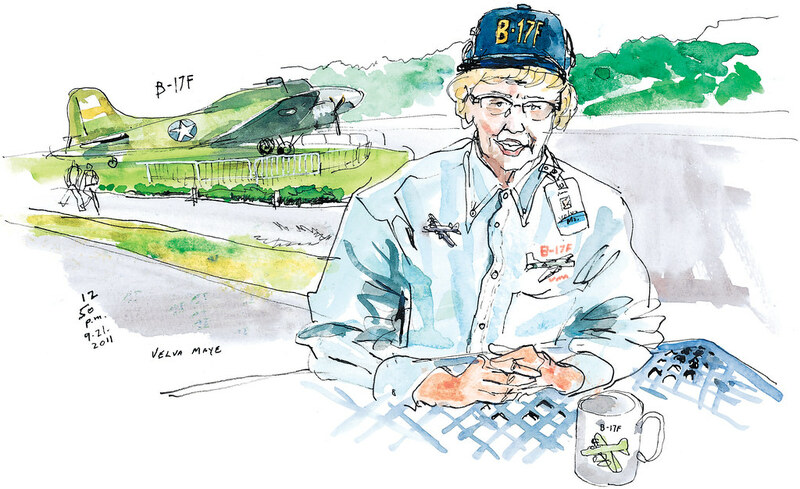 Velva Maye, 87, shares a similar feeling about B-17 bombers. During World War II, she was one of a four-woman team in charge of ordering the rivets, clamps, nuts and bolts that kept the “Flying Fortresses” together. And, after retiring with 40 years of service, she and other volunteers helped restore one that is parked outside the Museum of Flight. 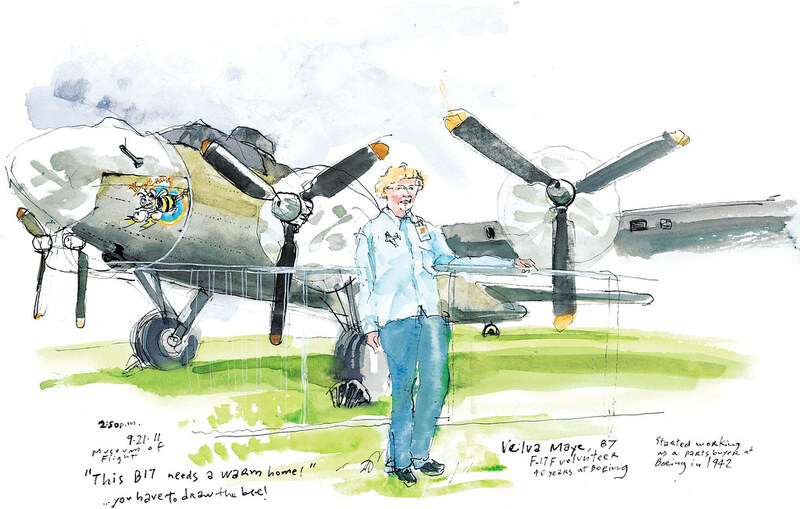 As proud as Maye is of “her” plane, she’s also worried that leaving it outdoors may ruin the years of restoration work, and she’d like to find a hangar for it. “It needs a warm, dry home,” said Maye. More than 7,000 B17 bombers were built at Boeing’s Plant 2 just across Boeing Field. Demolition of the plant, which was camouflaged during the war to hide it from Japanese aircraft attack, started in 2010 and seems well underway. 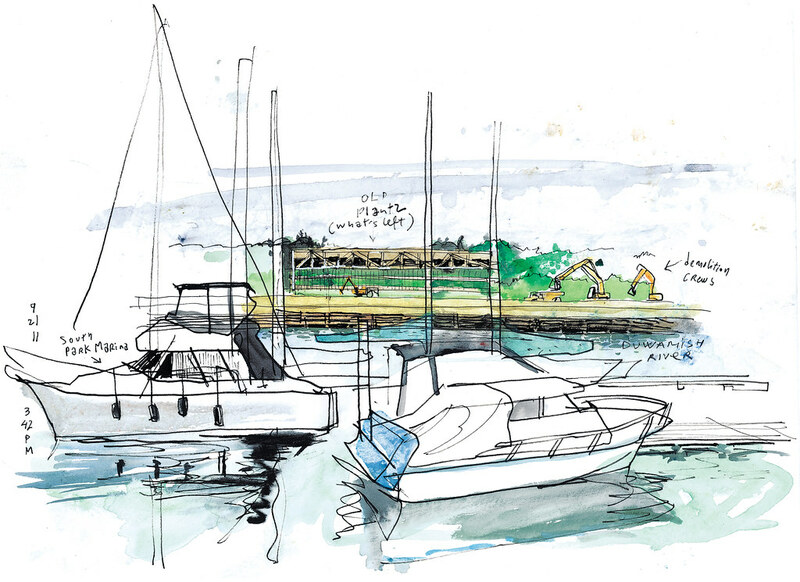 From the South Park Marina across the Duwamish River I could only see one piece of the building still standing. The demolition of the huge hangar buildings has completely transformed the landscape.